Arthur Currie was born on 5 December 1875 near Strathroy, Ontario, and he moved to Victoria at age eighteen. He secured a position as a school teacher, later working in insurance and real estate. He joined the local Militia, serving first in artillery and then in infantry. An energetic officer, he quickly rose in rank and by 1909 commanded the 5th Regiment, Canadian Garrison Artillery. In 1913 he transferred to command the 50th Regiment, Gordon Highlanders. The call of August 1914 brought Colonel Currie to Valcartier where the Canadian Expeditionary Force was being trained and organized; here he gained command of the 2nd Infantry Brigade. After training in England, his brigade deployed to France as part of the 1st Canadian Division. Although previously he had commanded only a few hundred militiamen, he was recognized quickly as an accomplished student of war. On 22 April 1915 the Canadians manning the Ypres salient found themselves consistently exposed to enemy fire; the enemy then launched the first major gas attack on the two French divisions on the left. Their panic-induced flight left the Canadian flank dangerously exposed. Two days later the Canadians were gassed but, instead of falling back, they drove off the attackers. At the height of the battle, when it seemed that Currie’s brigade must be overwhelmed, he walked over a shell-swept road to divisional headquarters to plead for reinforcements. Although the brigade on his left had retreated, the 2nd Brigade grimly held to its forward position. After losing more than half his brigade, Currie ordered his men to withdraw to the Gravenstafel Ridge. That night they were relieved by British troops – the Canadians had held! Colonel Currie’s leadership attracted immediate attention. He repeatedly identified the enemy’s intent and took steps to counter the threat. He was everywhere in the line, maintaining personal contact with his forward battalions and with flanking units. After the battles of Festubert and Givenchy, he was promoted Major-General and, at age 39, became one of the youngest to hold that rank in the British Army. With the formation of the 2nd Canadian Division, Canada fielded a Corps; a Canadian Commander was necessary for this important national symbol. After his success of Ypres, Currie was chosen as Commander for this new division. In a few short months Arthur Currie had risen from an obscure militia colonel to one of the most senior posts in the British Army. As Divisional Commander he was no stranger to the front lines; the men appreciated his willingness to share their danger. Word that the commander personally assessed the difficulties they would face in the attack spread rapidly. He disapproved loudly of the popular notions of hasty, unprepared counterattacks, large-scale trench raids and frontal assaults. Only when preparations were complete and massive bombardments finished did he commit solders. The Canadian assault on Vimy Ridge was planned meticulously; “silent” batteries were deployed and infantry platoons were reorganized into self-contained combat units. Detailed maps and plasticine models were used to brief the men; each soldier knew what he was expected to do. Vimy Ridge fell to the Canadians on the first day, Easter Monday, 1917, with relatively light casualties. Soon after, Currie was knighted and given command of the Canadian Corps. When the Canadians were assigned the capture of Passchendaele, Currie protested, advising Field Marshall Haig of impossible conditions, doubtful value of the operation and expected high casualties. The ultimate cost of Haig’s decision was 15,654 casualties to achieve a largely symbolic victory. Plans were made to split the Canadian Corps to reinforce British formations – again Currie protested, this time he won. Currie’s return to Canada on 17 August 1919 was not the hero’s welcome one might expect. Public resentment was evidenced in caustic remarks by Sir Sam Hughes. He accused Currie of incompetence, of glory seeking and alleged that Canadian lives had been squandered. Much controversy surrounded Currie and much still remains. His accomplishments are unparalleled and he was unquestionably the embodiment of the Canadian people larger than life; awkward in his naivety, direct and forthright, a civilian-soldier, just the right man to lead a nation at war. 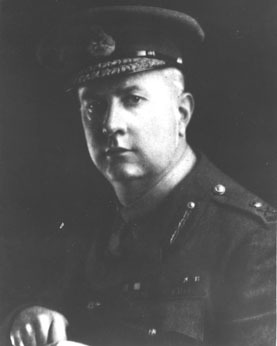 Arthur Currie died in Montreal on 30 November 1933 at the age of 58.